Sea squirts belong to a remarkable group of undersea animals called tunicates. As I explained in my previsous post, “Meet the Amazing Salp,” tunicates are saclike filter-feeders that live on plankton and organic matter they strain from the water they pump through their bodies. Although one could hardly tell by looking at their squishy bodies, sea squirts are also part of the phylum of chordates—the group of animals that include fish, birds, reptiles, and mammals! This is because in their larval stage, sea squirts have many of the anatomical features of vertebrate animals. 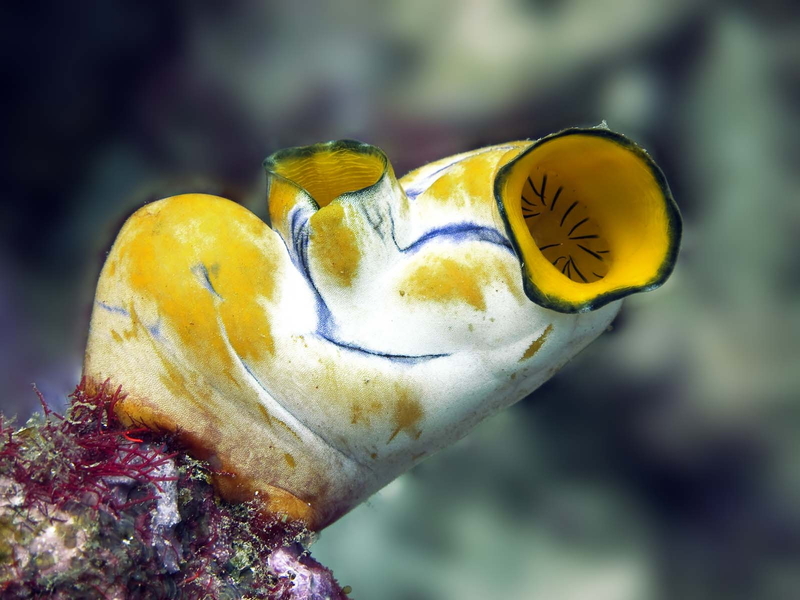 If you want to see some of the best images of sea squirts (and all manner of reef life) on the web, then you should stop by Madang – Ples Bilong Mi. Its a wonderful photo journal by my friend, Jan Messersmith. Jan is an expert diver and photographer, and on his site he shares witty, intelligent commentary and hundreds of beautiful underwater photos from the reefs off of Madang in Papua, New Guinea. 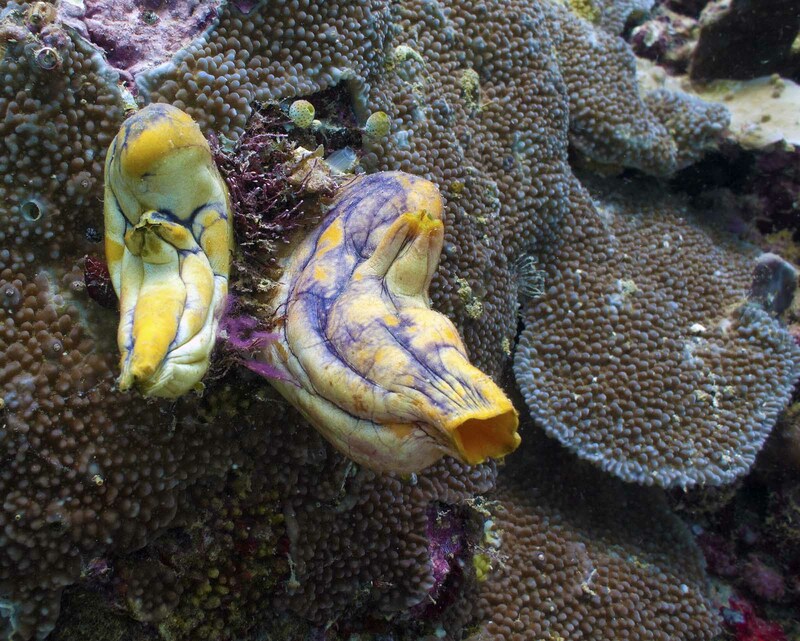 Do Sea Squirts Really Eat Their Brains? 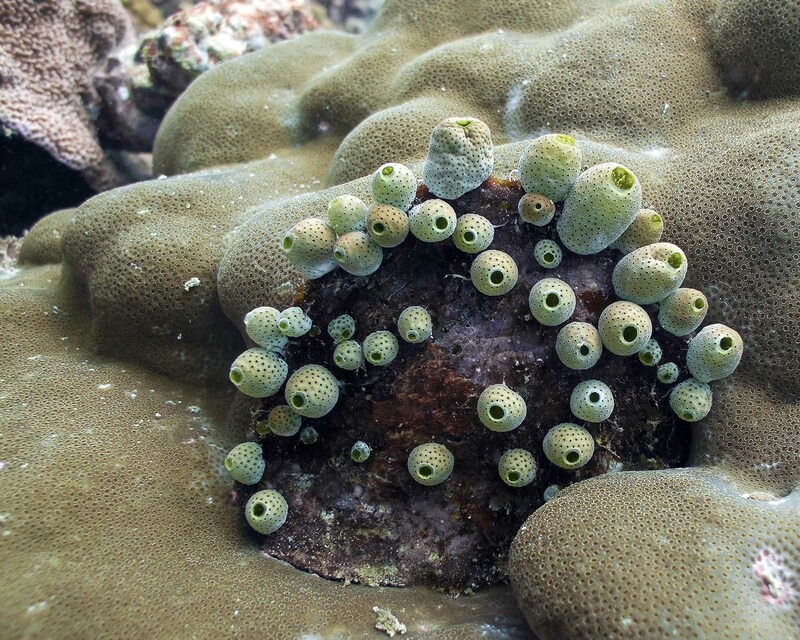 After the ability to squirt you in the eye, squirts are probably most famous for “eating their brains.” What happens isn’t quite as drastic as it sounds, but the sea squirt life-cycle is nonetheless “extreme” and fascinating. 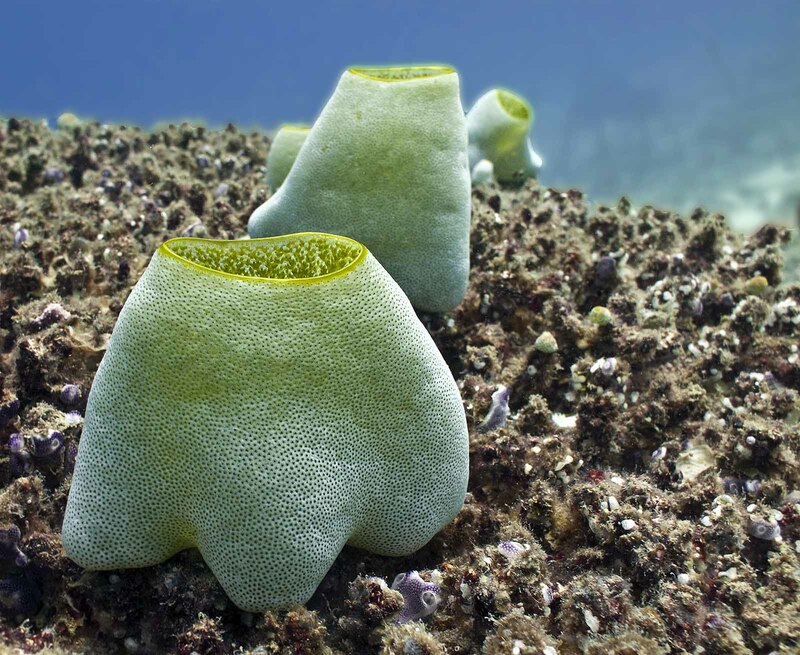 Sea squirts are hermaphrodites—they have both male and female reproductive organs. They spawn by releasing eggs and sperm into the water at the same time. After about three days, eggs develop into tadpole-like larvae, just like their relatives the salps. They wiggle and twitch around, which helps disperse them. The free-swimming larvae stage lasts only a short time, since the larvae aren’t capable of feeding. Soon, they settle to the bottom and cement themselves headfirst to the spot where they will spend the rest of their lives. They need to start feeding, so an amazing transformation begins. The sea squirt larvae begin absorbing all the tadpole-like parts that made them chordates. Where the sea squirt larva once had gills, it develops the intake and exist siphons that will help it bring water and food into its body. It absorbs its twitching tail. It absorbs its primitive eye and its spine-like notocord. Finally, it even absorbs the rudimentary little “brain” (cerebral ganglion) that it used to swim about and find its attachment place. So, yes, in common parlance, the sea squirt “eats its own brain,” such as it is. But since the sea squirt no longer needs its brain to help it swim around or to see, this isn’t a great loss to the creature. It needs this use this now superfluous body material to help develop its digestive, reproductive, and circulatory organs. A sea squirt is basically a big stomach inside a sack. The sack pumps water in and out of itself, filtering food carried to it by sea currents. Water comes in one siphon and heads down into the large basket-like pharynx. The pharynx has numerous sieve-like slits for the incoming water to pass through. Plankton in the incoming water get trapped in a sticky mucus coating the pharynx, and small hair-like cilia help move the plankton to the stomach for digestion. Filtered water and waste products are expelled through the second siphon. Sea squirts are fascinating animals. They may look primitive but are in fact one of the most highly evolved marine invertebrates. They start out looking like tadpoles and end up looking like beautiful leathery bags and blobs. In the process, they “lose their minds,” so to speak! In the larval stage, the sea squirt has characteristics that make them part of the same chordate phylum to which all fish, birds, reptiles and mammals belong. In the adult form, the sea squirt is little more than a water pump, pumping water into its vascular system, extracting nutrients, and pumping the water out. 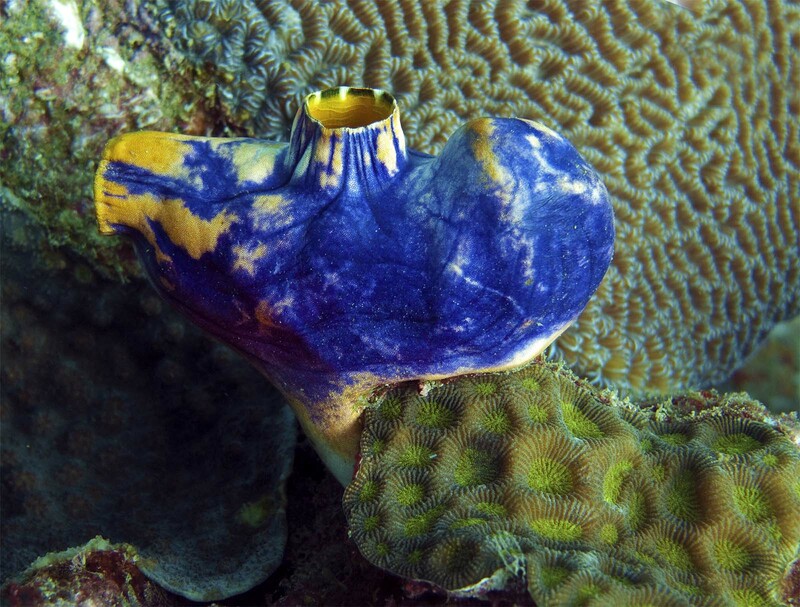 Truly, the sea squirt has one of the most extreme and unusual life cycles of any animal. It is certainly one of the most unusual and strangely beautiful creatures in our oceans. That is really, really cool. Never knew that! I added you to my blogroll, by the way. I may have to start a new list of science blogs I follow. These creatures have sadly been cited by opponents of academic tenure. They have a rudimentary brain whose sole function is to find a place to latch on and feed. After that, it is absorbed and disappears. I have tenure and love it, but there are daily frustrations dealing with those sea squirts. of course these organisms as i see and observe them are similar to sponges in many factor like environment, mode of nutrition, appearance, etc.